Hiya bunnies! I hope you are all having a wonderful week! Today is a look that is a little bit different for me, but I like it! Sometimes you just gotta be in charge! Zenith has the most marvelous set at The Epiphany. The Criminal Police set is just fantastic! My entire outfit today comes from the set and makes me feel totally in charge. The black color is, of course, all rare. The clothes only fit the Maitreya body and hands. There are 35 commons, 3 rares, and it’s 75L a pull. Don’t forget that at The Epiphany, you can turn in your extras for Epiphany points to trade in for exclusives. The exclusive from Zenith this round is a megaphone so you can shout your orders! Hey bunnies! No fashion today – because it’s Relay For Life weekend!! 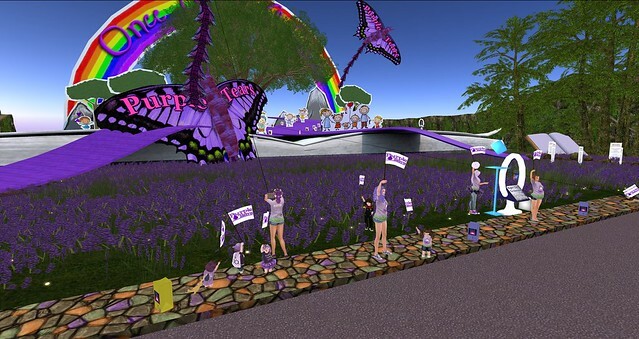 It would be great if you all could stop by our team’s campsite [Team Purple Tears!] and donate! You get to help out a great cause, meet lots of cute little kids, and have some fun! We’ll be walking soon, but you’re welcome by any time! There are also donation items to purchase! Go Relay!! PS: Put your graphics low. It’s a little bit laggy right now.